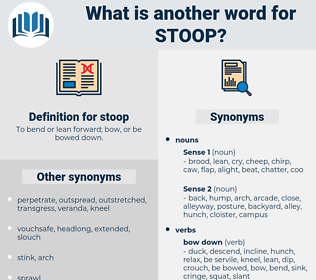 What is another word for stoop? To bend or lean forward; bow, or be bowed down. lay down and roll over. grow, ascend, stretch, fight, rise above, straighten, rise. If thou submit and stoop willingly to Godâ€™ s good pleasure, thou wilt make it a more easy yoke, and light burden. The third type of stoop has the same broad platform before the door, but the flight of steps is along the front of the house at one side rather than directly in front. stave, stovepipe, shade off, sawed-off, step up, stubby, suggestive, southpaw, stiff, sicative, sit by, stative, stop, sweet bay, Stupa, stay up, set up, step-up, sedative, sit up, shut up, sixty-five, stab, sweet pea, stoup, staffa, stub, stuff, stave off, set off, Stupe, step, sweetpea, side view, Swot Up, shtup, sky dive, sit-up, stupefy, stp, sweat off, stoep, side of beef, steppe, staph, stevia, sheet web, stuffy, stop up, stay off, stove, soda pop, skydive, s.t.p., shoot up, staff, shut off, setoff, stipe, steep, stob, setup. pounce, incline, swoop, slope, pitch.